winMASW® is a software application for the joint analysis of seismic data designed in order to achieve highly-reliable Vs (shear-wave velocity) vertical profiles. 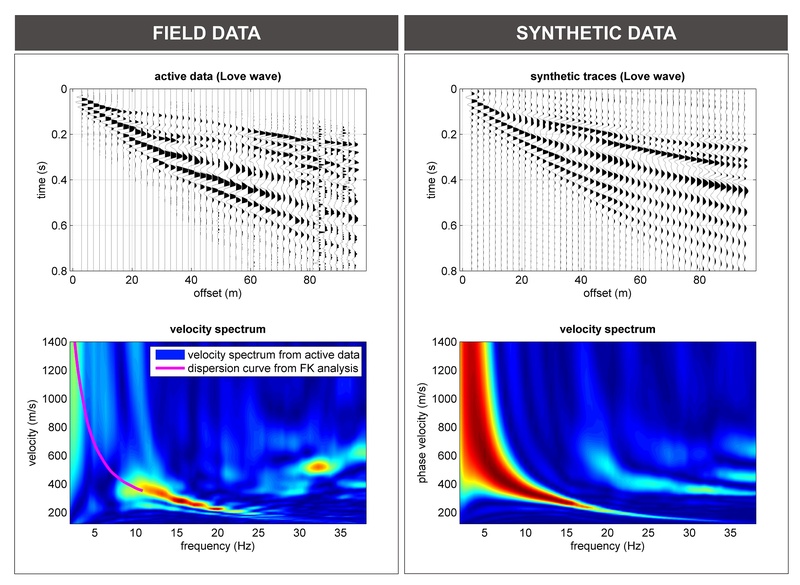 The key feature of winMASW® is represented by the possibility of jointly analyzing different data such as: Rayleigh and Love-wave MASW (phase velocities) and MFA (Multiple-Filter Analysis for group-velocity determination), FVS (Full Velocity Spectrum) analyses, modeling of P- and SH- wave refraction travel times (1D), HVSR, ReMi, ESAC (bi-dimensional array providing much better performances compared to ReMi) etc. This way we can overcome the problems related to non-uniqueness of the solution and all the possible ambiguities in the data interpretation. Please consider that the "best" techniques to adopt for a survey actually depend on the goals and on the complexity of the site. For this reason winMASW® offers a complete arsenal of tools capable of handling any kind of analysis and problem. winMASW® is available in six different versions: Academy, Professional, 3C, Standard, Lite and winHVSR. In order to get the best quote, in addition to mentioning the version(s) you are mostly interested in, it is always useful to specify your current equipment (i.e. seismograph, geophones etc) and/or the kind of surveys you intend to perform. If you currently do not have any equipment, please contact us before buying it. winMASW® and HoliSurface® work by means of a hardware key (USB dongle) and can be installed on an indefinite number of computers (for the use it is clearly necessary to insert the key). The compatibility with different operating systems depends on the version (Academy, Professional, 3C, Standard, Lite, winHVSR) and the release you have. All the releases from the 7.0 are compatible only with 64-bit operating systems while the previous versions can operate on both 32 and 64-bit OS, except winMASW® Academy and HoliSurface® that work only on 64-bit operating systems. HoliSurface®6.0 and winMASW® 7.1 (and successive releases) work also with win10 (64bit). Anyway, the suggested OS is win10 (64-bit). At any time is possible to upgrade the software to some higher version (e.g. from Standard to Academy). In order to receive the software updates released after the date of the purchase a fee is required. To complete the purchase is necessary to register the software products by sending an e-mail (winmasw@winmasw.com) reporting the product (winMASW® and/or HoliSurface®) you bought, the version (Academy, Professional, 3C, Standard, Lite, winHVSR), the reseller from which you bought it and, finally, the UID (User ID) and SN (Serial Number) reported in the key holder. This way, you are entitled to receive software updates (free for the first year), news and case studies. Failure to register within one month after purchase involves the loss of the right to assistance and to get free updates during the first year. We consider all our work (see all the case studies available on our website and the Elsevier book "Surface Wave Analysis for Near Surface Applications") and publications as the best demo. Exceptionally, upon payment of 100 Euros (plus shipping charges) as deposit, we can provide a USB dongle with a limited number of analysis (demo version): if the product will be suitable and You will decide to purchase it, the software dongle can be activated permanently with a brief on-line procedure (and the cost of the deposit will be deducted). Otherwise, the deposit, less shipping charges, will be returned once you give us back the demo dongle. The Educational License is reserved to Universities and scientific institutions for educational purposes only and is granted sending two USB dongles instead of just one (standard/commercial license). Since we strongly believe that the use of the software for educational purposes requires the most advanced techniques for the analysis of surface waves currently available, the Educational License is provided only for winMASW® Academy and HoliSurface®. Institutions who choose such a license are required not to use the software for not merely educational purpose. If a University or Research Institution intends to apply for an Educational License, a prior formal declaration (signed by the head of the Department/Faculty/Institution) regarding the merely-educational use of the software is required. The institutions who carry out contract work for any third party can opt for a Standard License (one USB dongle) or, alternatively, for a mixed License (two or more USB dongles provided at a price that will be fixed case by case). Assistance will be provided by e-mail, through a remote session via Ammyy Admin software or by phone appointment. For further information please see the conditions of the End User License Agreement.